When people are talking about innovation, the insurance industry rarely finds a mention. While the mid-1900 saw the use of a lot of technologies and innovative ideas, the spurt has gradually died down, with the segment requiring a shot in the arm again to gain momentum. With the segment built on the notion of managing risk efficiently, the need for change may be rarely felt. Companies in the segment have always managed to invest premiums received efficiently and somehow remain in the black. Although, the industry can be considered averse to sudden change, it has by no means ignored the needs of customers. This is one industry which constantly churns out products and strategies to attract new customers as well as retain old ones. However, just like the stock market, the insurance industry’s strategies have not been matching historical precedents. For one, cut throat competition, erosion of customer loyalty and the depleting growth in insurance premiums has forced companies within the sector to come up with solutions that add to the bottom line and help in providing value to precious customers. In addition, their revenues are not sky high, like they used to be during the golden decade of 1960 to 1970, resulting in a pressure to constantly lower cost and find new sources of revenue. In a heavily competitive market, the ultimate goal for any insurance company would be to keep customers happy. This would ensure their loyalty and prevent them from switching over to the competition. However, keeping a tech-savvy customer who has access to information and is always impatient for solutions is not an easy task. A CRM solution that is customized for insurance companies employs a multi-prong approach for one simple goal - to keep customers satisfied. A CRM solution not only helps insurance companies in predicting customer expectations, but also collects important information that equips customer service executives in call centers to serve customers better. If an insurance company is able to solve a majority of customer queries at the call center, it can ensure complete customer satisfaction. In addition, a detailed profile that is put together with the help of data from the CRM software helps insurance companies in handling customers with a more personalized touch. The ultimate result - enhanced experience and happy customers. As I mentioned earlier, competitiveness in the insurance industry is staggering. In such a scenario, equipping the sales force with the latest communication tools and technology can be the difference between a successful company and an unprofitable one. A CRM solution ensures that the most up-to-date information is available, not only within the corporate office, but also with the sales force, which is usually mobile and active in the field. Mobile CRM solutions are increasingly being deployed to increase the effectiveness of sales pitches. This strategy is coming up mainly due to the prominence of tablets and smartphones with the customers and the sales force too. The purpose of such an integrated CRM solution is simple for any insurance company - to provide the sales force with access to business and customer details, so that closing a business deal becomes easier and convenient. The sales team of an insurance company has to be constantly on their toes to remain competitive and close deals faster. 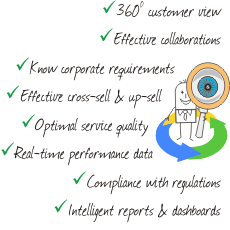 An effective CRM solution in an insurance company gathers data efficiently. This, in turn, enables the sales force to foresee customer expectations with precision and as a result, enable them to sell more competitively and aggressively. In addition, it also gives them detailed information about newest products introduced by the company and match them with the needs of the customer they are facing. In addition to the bottom line, insurance companies are also giving due importance to customer loyalty. As with any company, their brand's reputation is becoming increasingly important because online tools make it easy for customers to share their feedback and enhance or tarnish any company’s image. A CRM solution not only aligns internal and external process, but also helps the sales team in collaborating with agents and customers. Some CRM solutions also help companies in monitoring and resolving customer concerns on social networks. By meeting customer expectations, insurance companies can maintain their brand image in the long run and establish a reputation in the segment. Insurance companies are typically constantly under pressure to cut costs and add to their bottom line in whatever way possible. However, this needs to be done while delivering quality products, world class services and satisfying customers completely, even after the sale has been made. A CRM solution enables effective management of customer requirements, thereby adding to revenue growth each year. In addition to ensuring customer satisfaction, a CRM solution also adds to the efficiency of company employees, helping further in reducing costs. Leaders in the insurance industry are increasingly realizing that an effective CRM solution can help retain existing customers as well as attract new ones. Insurance companies, although slow on the offtake, are increasingly getting prepared to leverage the latest technology for cutting costs and increasing profitability. A CRM software is part of this strategy. After all, that is what will ultimately help them remain competitive in the toughest of markets.